The landmark decision, according to Chairman Ajit Pai, will promote competition among internet providers. The Federal Communications Commission, led by Ajit Pai, voted Thursday to repeal net neutrality and allow internet providers to speed up services for some websites and applications -- and block or slow down others. The landmark decision, made by a 3-2 vote in favor of repeal, rolls-back Obama-era regulations in favor of broadband companies. Net neutrality prevented ISPs from creating internet fast lanes and blocking websites. Deregulation was highly opposed by democrats, technology companies and consumer groups, who all heavily lobbied to stop the repeal. In fact, a recent Washington Post survey found that 83 percent of the population opposed the plan. It’s big victory for republicans -- and Pai -- who vowed to roll back net neutrality before President Donald Trump came into office. 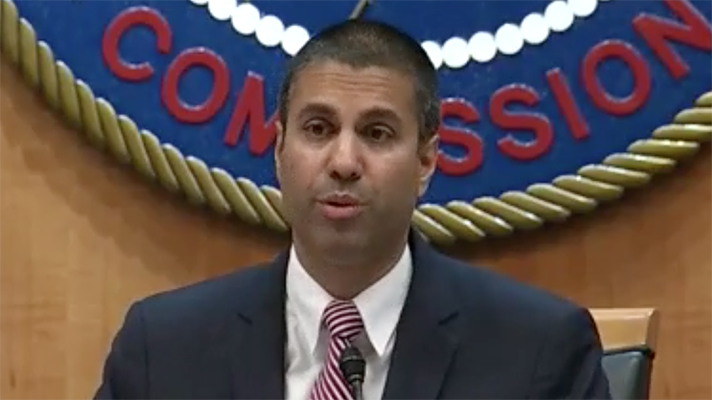 The FCC went even further and removed some of the agency’s authority over broadband in an attempt to dissuade future FCC commissioners from attempting to regulate ISPs. Pai said the repeal will eventually help consumers as it will fuel broadband providers to offer a wider range of services. In the past, Pai has said that net neutrality is bad for telemedicine and that the repeal will help serve those in underserved areas. However, many of those in the industry said that was a stretch. Thursday’s repeal marks a long line of actions by Pai, since his appointment in February. He’s reduced caps on how much broadband providers can charge business owners, lifted media ownership limits and slashed a low-income broadband program.